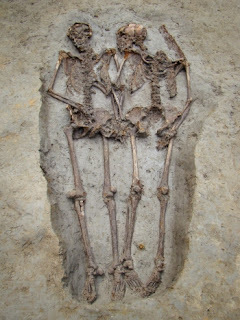 Laid out side by side and holding hands, these 1,500-year-old male and female skeletons are surely a sign of eternal love if ever there was one. The lovers were probably even ‘looking into each other’s eyes’ when they were buried in the 5th century, during the final days of the Roman Empire. The extraordinary discovery was made by archaeologists excavating an Ancient Roman palace in the Italian town of Mutina, known today as Modena. Anthropologist Vania Milani said: ‘It was a very touching and beautiful sight to see. Although not much is known about the couple, a picture is emerging. A bronze ring found among the woman’s bones, for example, suggests they were married. And they were probably also of noble birth as citizens of Mutina – famous for its pottery centre which made lamps for the Empire – were usually wealthy. With the number of plagues that ravaged Europe during this period, it has also been suggested that the couple died close to the same time. Their remains will be displayed in a museum near the town next year. The tomb was one of 11 found at a depth of around 10ft. Another one housed three male skeletons, all horribly mutilated – one was a teenager found with his skull between his legs. It has been suggested the trio were slaves executed by their master. However, Mrs Milani said evidence of slash wounds suggested they were victims of murder. It is not the first time ancient multiple burials have been discovered in Italy. In 2007, a couple were found dating back 5,000 years, also near Mutina.